The small sized Bichon Frise has a compact cuddly appearance, with a personality to match. Bichon Frises are sociable and happy dogs. They are charming and gentle, and they enjoy going everywhere with their families. They get along well in the company of other dogs and pets and are also good with children. The Bichon Frise is an obedient breed that excels at learning tricks, but are known to be quite difficult to totally housebreak. When choosing a Bichon Frise, look for eye, ear, and skin problems. This breed is also prone to epilepsy and dislocated kneecaps. Breed Type The Bichon Frise is a non-sporting breed that makes a wonderful companion and show dog. These sociable dogs do best indoors. Background The Bichon Frise was first bred in 14th century Spain. A cross between the Barbet Water Spaniel and the Poodle, the breed was often bartered among sailors. The Bichon Frise made its way to France in the 16th century, where it was often trained for the circus. Popular hybrids of the breed include the Bichon-A-Ranian, the Cavachon, and the Bichon Poo. Description Bichon Frises are usually white in color, but some have cream, gray or apricot hairs mixed in. They have fluffy, loosely curled coats. 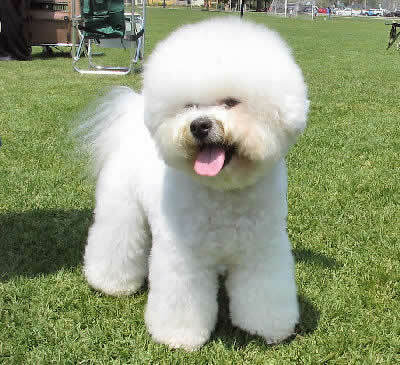 The Bichon's eyes are dark and round, its ears medium length and covered with hair, and its muzzle moderate and blunt. The breed averages 9-12 inches tall and weighs 7-12 pounds. Care and Feeding The Bichon Frise's diet should consist of foods derived from poultry, lamb, fish, rice and wheat. This breed requires frequent grooming, with professional grooming and bathing recommended monthly. It is important to pay special attention to keeping the hair around the eyes and ears trimmed. The Bichon does not shed often, and its fur is unlikely to cause allergic reactions. No special cleaning is necessary when you have this breed in your home. Housing Your Dog The Bichon Frise is an indoor dog, and it can flourish in small spaces. Due to their small size, it is important to look out for them underfoot and on couches or chairs. Social Behaviors Bichon Frises are very social animals, and they love the company of humans, dogs, and other pets. They do very well with children. Handling and Training Bichons are fairly easy to train for the most part. They are, however, notoriously difficult to housebreak. Crate training is advisable. Some owners claim that their Bichon Frises were never completely housebroken. Activities The Bichon Frise is an active breed and needs a walk each day. They enjoy playing outdoors off-leash on occasion. Breeding/Reproduction On the whole, Bichons are healthy dogs with few hereditary health problems. Cancer and blood disorders are the main concerns when selecting a mate for breeding purposes. Common Health Problems Bichons are prone to allergies, particularly skin allergies. They are often sensitive to flea bites. More serious but rather infrequent health concerns include epilepsy, blood disorders and cancer. Availability Bichon Frises are hard to find in some areas, but can usually be located online. Prices average $400 to $600. When you state "they are good with other pets", you better make sure parakeets are not included. Our bichon ate our parakeet WHOLE this Saturday in from of friends and family. He is 6 yrs. old and very jealous. I will never be able to have another pet in the house. This was very traumatic. There so cute and funky. Non-sporting dogs are diverse group of dogs, their characteristics and features cannot be generalized. They are good friends to human. Non-Sporting dogs may no longer perform the tasks they were originally bred for.